Wu wei (無爲) is an important concept of Taoism, that involves knowing when to act and when not to act. Another perspective to this is that "Wu Wei" means natural action - as planets revolve around the sun, they "do" this revolving, but without "doing" it; or as trees grow, they "do", but without "doing". Thus knowing when (and how) to act is not knowledge in the sense that one would think "now" is the right time to do "this", but rather just doing it, doing the natural thing. Wu may be translated as not have or without; Wei may be translated as do, act, serve as, govern or effort. The literal meaning of Wu Wei is "without action" and is often included in the paradox wei wu wei: "action without action" or "effortless doing". The practice of wu wei and the efficacy of wei wu wei are fundamental tenets in Chinese thought and have been mostly emphasized by the Taoist school. The aim of wu wei is to achieve a state of perfect equilibrium, or alignment with the Tao, and, as a result, obtain an irresistible form of "soft and invisible" power. 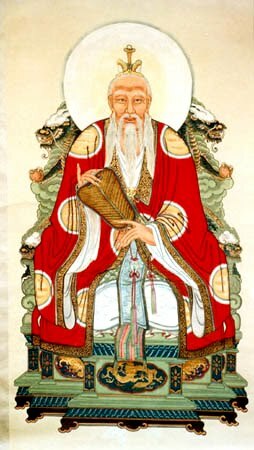 Several chapters of the most important Taoist scripture, the Tao Te Ching, attributed to Laozi, allude to "diminishing doing" or "diminishing will" as the key aspect of the sage's success. Taoist philosophy recognizes that the Universe already works harmoniously according to its own ways; as a person exerts their will against or upon the world they disrupt the harmony that already exists. This is not to say that a person should not exert agency and will. Rather, it is how one acts in relation to the natural processes already extant. The how, the Tao of intention and motivation, that is key. Wu Wei has also been translated as "creative quietude," or the art of letting-be. This does not mean a dulling of the mind; rather, it is an activity undertaken to perceive the Tao within all things and to conform oneself to its "way." The goal for wu wei is to get out of your own way, so to speak. This is like when you are playing an instrument and if you start thinking about playing the instrument, then you will get in your own way and interfere with your own playing. It is aimless action, because if there was a goal that you need to aim at and hit, then you will develop anxiety about this goal. Zhuangzi made a point of this, where he writes about an archer who at first didn't have anything to aim at. When there was nothing to aim at, the archer was happy and content with his being. He was practicing wu wei. But, then he set up a target and "got in his own way." He was going against the Tao and the natural course of things by having to hit that goal. A fully achieved person is like a spirit! The great marshes could be set on fire, but she wouldn't feel hot. The rivers in China could all freeze over, but she wouldn't feel cold. Thunder could suddenly echo through the mountains, wind could cause a tsunami in the ocean, but she wouldn't be startled. A person like that could ride through the sky on the floating clouds, straddle the sun and moon, and travel beyond the four seas. Neither death nor life can cause changes within her, and there's little reason for her to even consider benefit or harm. This passage is metaphorical. To a Taoist, things arise dependently. The soul and body go together, because if there were no soul, there would be no body and if there were no body, there would be no soul. All these arise dependently. (This is the meaning of the Yin-Yang symbol; if there were no yin, there would be no yang and if there were no yang, there would be no yin). A person who follows the principle of wu wei thus realizes how ridiculous it is to cling to good and to obsessively stay away from evil. By realizing how things arise dependently, a Taoist is able to accept both the good and the bad. Because he is able to accept any outcome, he is then able to have no goal to aim at. When Zhuangzi is saying a fully achieved person is like a spirit, he is saying that a fully achieved person does not differentiate between good and evil, benefit and harm, and therefore is not concerned with them: his actions become one with the Tao and as such he leaves no trace of having acted, nor can the consequences of his actions affect him. Hope you do not mind I linked it over to my site.